Made a quick trip to Surfas Restaurant Supply yesterday, and picked up a nice 24-quart aluminum pot. Shown above is my 12-quart stainless steel pot resting inside the larger pot, which is filled with warm water. This will save a lot of water, since I was previously using my sink to hold the hot water, and had to keep adding more hot water as it cooled down. 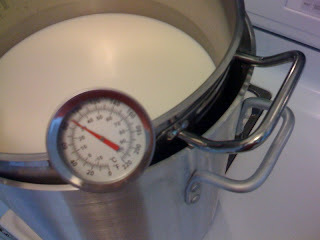 Now, I just need to turn on the burner on my stove for a couple of minutes, and voila!, back to the right temperature.